In the spirit of Le Flambeau Foundation’s commitment to education for youth in Haiti, provided is access to archived readings. Haiti has historical connections to many countries and cultures throughout the world. Our collective experiences shed light on future paths. These readings offer perspectives that serve as the foundation for building the framework and leading the transformation, to sustainable solutions for Haiti. The outcome will extend the positive impact for Haiti, to our global community. The articles and documents in this pamphlet were printed in The Nation during the summer of 1920. They revealed for the first time to the world the nature of the United States’ imperialistic venture in Haiti. While, owing to the censorship, the full story of this fundamental departure from American traditions has not yet been told, it appears at the time of this writing, October, 1920, that “pitiless publicity” for our sandbagging of a friendly and inoffensive neighbor has been achieved. The report of Major-General George Barnett, commandant of the Marine Corps during the first four years of the Haitian occupation, just issued, strikingly confirms the facts set forth by The Nation and refutes the denials of administration officials and their newspaper apologists. 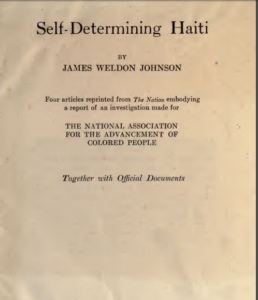 It is in the hope that by spreading broadly the truth about what has happened in Haiti under five years of American occupation The Nation may further contribute toward removing a dark blot from the American escutcheon, that this pamphlet is issued.